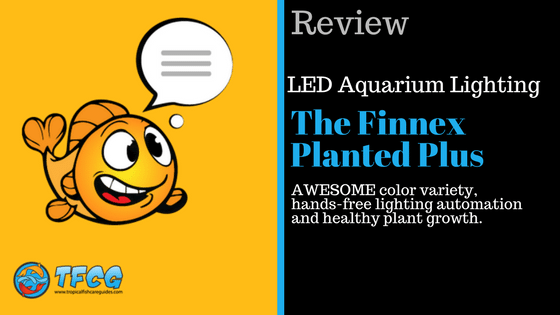 Finnex Planted Plus Review (2019) - Looking For Healthy Plant Growth? The Finnex Planted+ 24/7 Fully Automated Aquarium LED is a low-profile fixture with some advanced features. It’s hard to go wrong with Finnex lights, and this LED fixture is no exception. Take the 24/7 automated light cycle, for example. This feature enables the fixture to run hands-free in 24 hour cycles, and repeats daily for as long as you want it to. This Finnex LED also comes with color customization and memory save slots. This baby packs a real lighting power punch–the only issue you’ll have here is algae growth (if you’re not careful). 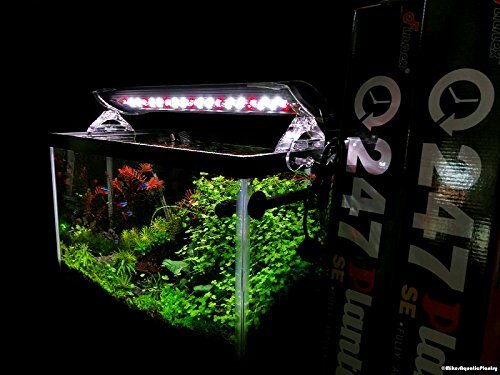 If you need a light at a good price point, with built-in automation, and enough brightness to grow your plants, the Finnex Planted+ 24/7 fixture might be the perfect planted tank aquarium light for you. What’s the Deal with the 24/7 Full Automation Feature? Is the Finnex Planted+ 24/7 Fully Automated Aquarium LED Right for You? This titular feature gives you fully automated day/night lighting cycles. It’s a great, hands-free way to enjoy the tank in the morning, afternoon, and at night, without over-lighting your plants. The lights will gradually ramp up and dim down throughout the day, and change color to simulate nature (think reddish dawn and a bluish dusk). You can see a demo of this cycle on the Finnex website. Or, just watch it now! You can design your own custom tank colors by controlling the levels of red, green, blue, and white. You can save these custom colors, which could be great for showing off your tank to friends or simply admiring it in its best light. If you’re getting too much light (or too little), you can adjust the brightness. This is helpful because every tank will have different needs. It’s good to have a way to customize the brightness for your tank’s size and bioload (this is not supported in 24/7 mode, more on this later). YouTuber ReefDudes has a Planted+ 24/7 Unboxing and Review video. The video shows him unpacking the Finnex LED and demonstrates how easy it is to set up on your tank. There are a few things you should know about this light, (not everything is perfect). The remote control can be tedious. Some customers have trouble getting it to work well. Make sure the IR sensor is in a good spot! Getting in and out of 24/7 mode can be confusing if you forget the button sequence. This will get easier as you familiarize yourself with how it works (and you can always consult the manual, which is linked in the next section). And finally, the colors and intensities on 24/7 mode cannot be adjusted–you’re stuck with the factory settings during the automated cycle. Setup for this Finnex aquarium light is pretty straightforward. You attach the legs to the light and adjust the legs to fit your tank. You’ll want to find a dry spot with clear sightlines for the IR remote sensor (you know, so your remote actually works). 24/7 Mode is ready to go as soon as you plug the light in, it’s just a matter of hitting the right buttons. The Finnex Planted+ instruction manual can help you with that. If your remote is unresponsive, make sure you’ve removed the clear plastic from the battery slot. And make sure you’re pointing the remote at the IR sensor. You can also try repositioning the batter in the remote. What’s the difference between the original Finnex Planted+ 24/7 model and the SE model? The Finnex Planted+ 24/7 Fully Automated Aquarium LED SE model was released more recently, and it comes with a few changes. There are a few key differences between the two Finnex lights. For one, the legs are different. The SE legs feature a new design that allows the light to pivot on hinges. In addition, the light sits higher off the top of the tank. These adjustments make it a little easier to access your tank, especially if you have a hood. Another difference is that the SE actually has a period of darkness built into the automated cycle. The original Planted+ is on at all times (but, as you’ll see in the next section, the PAR during this time can get negligibly low). If you want to give your fish/aquarium time without any light at all, The SE has that built into the timer. Finally, the SE comes equipped with “true red” 660nm LEDs. Do you need these three components? Nope! (otherwise we’d be writing our review for the SE model instead!). They could be handy–the true red LEDs might be a little better for your plants, some people might want their tank lights to be completely off for part of the day, and the new hinge legs might make tank access more convenient. But even without those features, the original Finnex Planted+ 24/7 fixture is a great investment. The 24/7 mode sounds good on paper, but is it right for your tank? As we’ve briefly mentioned, 24/7 mode is a handsfree day/night cycle, built right into the fixture’s programming. YouTuber Aquarium Co-op made a video review that looks at all the PAR (Photosynthetically active radiation) ratings for each time of day. If you’re wondering about light levels, this video will give you an idea of the total light that your tank will get throughout the 24 hour period. We’ve listed the ratings from the video below. On the max brightness setting, the PAR rating is right around 60. We should also note that the 24/7 Finnex LEDs gradually cycle through these PAR ratings. This means the light intensity between 9 AM and Noon (for example) is gradually increasing. It’s not a sharp increase at noon, but a gradual ramping up of light intensity during that three hour span. Even though the LEDs are on for a full 24 hours, they dim low enough to read 0 on a PAR meter. So your plants and fish will get a break from photosynthetically active radiation. When it comes to built-in timers and plant growth, few lights bridge the gap as effectively as this Finnex LED light (and the price is right, too). The automated timer regulates a full 24 hour cycle. When your lights are off the automated cycle, the brightness and color schemes are highly customizable and includes memory slots. Setup is quick. This light is fairly priced for the features. And Finnex aquarium lights tend to be reliable. If you like color variety, hands-free lighting automation, and healthy plant growth, you should seriously consider the Finnex Planted+ 24/7 LED fixture.